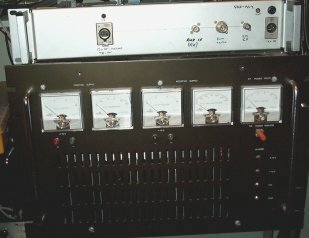 My transverter is very 'home brew', combining old varactor multiplier technology for the LO,a very sharp waveguide filter, and GaAs Mimics for the front end. It was built from my Junkbox in one evening, after I obtained the 'ultimate' in 6cm accesories.. a 6 GHz 100W solid state amplifier and PSU. The amplifier will need slight retuning for 5.7 GHz, as it only runs 35W in the amateur band, but will probably be pressed into service sooner than I can acompliseh the retune HI. 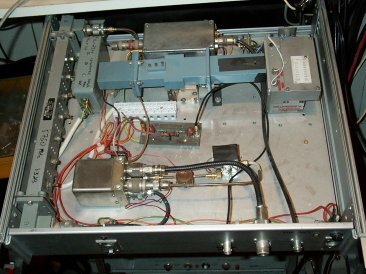 Charlie G3WDG has provided a prototype preamp, and EME operation is expected in the near future. I have recorded 10dB sun noise from the RX part of the system. I will post progress reports here. Solid state PA (below transverter) requires 10V at 80A ! 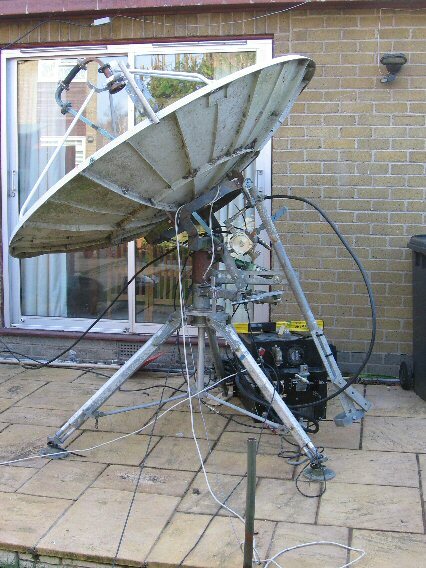 Using the old 10GHz 1.8m dish I built up a station over a period of about a week from all the bits I had lying around. 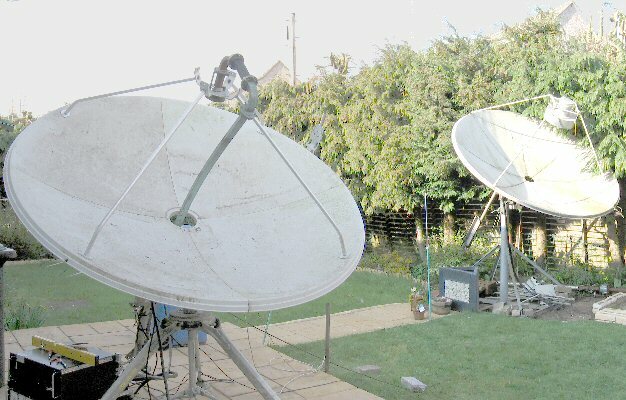 The Dish was positioned in the back garden so as to be able to see the moon at bearings not possible for the larger dish. This gave me a common window with Japan. The system was somewhat lashed up, but was fully steerable, and tracking was by moon noise. Performance of the system was not optimum, as sun and moon noise were lower than expected, but I did not have enough time to optimise anything. TX power was better than expected at 50W. After some problems on the morning of the contest weekend, I finally found 8N1EME on the band, at good strength.. a genuine S7 on the meter! This is was not too much of a suprise, as they were running 500W to a 32m dish. They were without doubt the strongest signal I have ever heard off the moon. 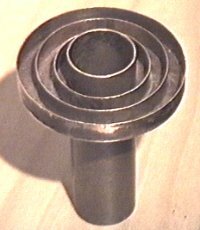 It took a further hour to finish the wiring for the antenna changeover, and after I discovered I had missed a vital interlock connection, I was ready to transmit. An easy QSO resulted, I recieved a 449 report, at the time they were 559. I was also heard by F2TU, RW1AW and I heard RW1AW (O copy) OK1KIR (M copy .. weak with lots of doppler smearing) and traces from F2TU. no further QSO resulted but I am certain I could work Alx RW1AW with this system as it is. The system had to be dismantled after I lost the moon at about 15:30.
next operation will be using the 2.4m dish, and I hope to go circular polarised (I was vertical for these tests) The net gain will be 5dB even if I get no better performance that I had on the 1.8m dish, though I estimate a furter 3dB is possible when the system is optimised.